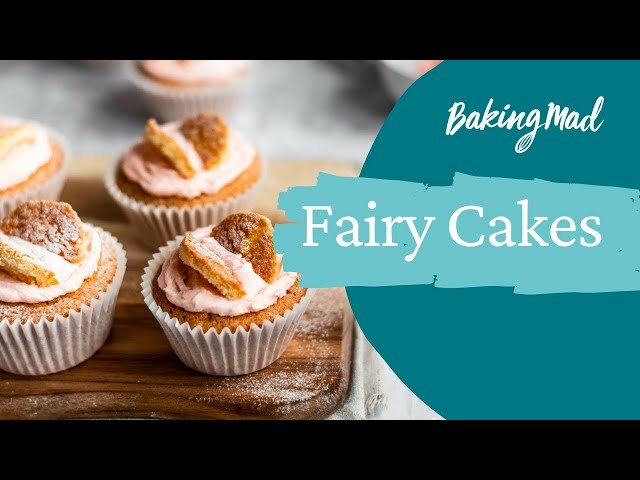 This butterfly cakes recipe is so tasty and easy to make. It's the perfect starter recipe for novice bakers or great to make with kids. For the cakes, preheat the oven to 180°C fan (160°C, 350°F, gas 4) Line a 12-hole muffin tray with paper cases. Place the butter and sugar in a bowl and beat until pale and creamy. Add the eggs one at a time, beating until well combined. Fold the flour into the mixture and add the milk. Divide the mixture between the cases and bake for 20 - 25 minutes. Remove from the oven and cool on a wire rack. For the butter icing beat the butter in a large bowl until soft. Add half of the icing sugar and beat until smooth. Add the remaining icing sugar and one tablespoon of the milk and beat the mixture until creamy and smooth. Beat in the milk if necessary, to loosen the mixture. Using a small pointed knife cut a circle about 2.5cm width out of the cake leaving a cavity in the centre. Cut the round in half and set aside. Now fill the centre of each cake with the buttercream and return the two pieces of cake to sit on top like butterfly wings. Dust with icing sugar to serve.